October 23, 2008 -- A $1 million gift from the Bernard Osher Foundation to San Francisco State University will make college more affordable to students who start higher education late in life or return after a significant break. The funding will establish a re-entry student scholarship endowment that will award $2,000 scholarships to at least 25 outstanding undergraduate students each year. 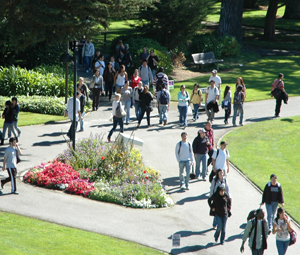 Hundreds of SF State undergraduates are re-entry students. SF State is one of only 28 higher education institutions to be endowed by the Osher Foundation for this purpose. The Foundation provided SF State grants of $50,000 for each of the past two years. SF State was awarded the endowment after successfully administering the scholarship program during that time. In addition to the endowment, the Osher Foundation has provided a $50,000 grant to support 26 scholarships during the 2008/2009 academic year. Recipients of Osher re-entry scholarships are students who are at least 25 years of age and seeking their first baccalaureate degree. A total of 172 SF State students competed for the aid this year. "We are honored by the Osher Foundation's support and grateful for their generosity," said Jo Volkert, associate vice president of enrollment management. "Each year SF State admits hundreds of re-entry students. These scholarships will help some of our most determined and deserving students." The significant number of re-entry students at SF State is reflected in the average age of its undergraduate student body. At 23, the average undergraduate is considerably older than those at other institutions. This year's re-entry scholarship recipients range from 26 to 50 years of age. Some of these students are returning to school after serving in the armed forces, while others left college to raise families or care for ailing friends and relatives. Several recipients are immigrants from Russia, Mexico and African, Asian and Caribbean countries. Native of Nigeria Debra Omoruyi is a nursing student who works in nursing homes and hospitals as a nursing assistant. She hopes to serve her clients as a nurse after her anticipated graduation in 2011. Fiona Fitzgerald, a mother of two, chose to leave a full-time job in the mutual fund industry to pursue an undergraduate degree full time. "At a time when technology is in a continuous growth mode and as the business place evolves into a global environment, I realized it was critical that I become better educated for long term success," she said. Fitzgerald is determined to finish her degree in four years. "The Osher re-entry scholarship is a great motivator. It will alleviate financial pressure and allow me to focus on my studies and to remain on track." "The Bernard Osher Foundation is delighted to recognize San Francisco State University in this way," said Mary Bitterman, president of the Foundation. "Re-entry students often have unique needs, including career counseling and familiarization with new information technologies, which they have to balance with obligations to family and work. San Francisco State has a solid foundation and reputation for providing such support." The San Francisco-based Osher Foundation supports performing arts organizations and museums in Northern California, integrative medicine programs and post-secondary scholarships at colleges and universities across the country. The Osher Lifelong Learning Institutes operate on the campuses of 121 higher education institutions including San Francisco State University.